As always, we'd been watching the forecast all week and with the promise of a good day on Friday, most people decided to "do something" on the way North. However there was much disgruntlement at the campsite on Friday evening that the promised blue skies hadn't materialised and depending on which hill you chose visibility varied between poor and non-existent. Friday evening however was warm with very little wind and no midges - we started off the weekend campaign of "staying outside as much as possible". With the help of Alan's lamp we sat outside chatting until well after dark before retiring to the pub for the rest of the evening. With an excellent forecast for Saturday plans were made for the next day. The morning dawned bright and sunny but with a cold wind - Gillian left at 7am to ensure the best use of daylight and in fact the whole club had left the campsite by 8.30am - for us an Alpine start. The weather was as forecast but only in the extreme West - the East end of Liatach was in the clag for most of the day but the West end was in the sun. Unfortunately for Lesley, she chose one of the Corbetts behind the Ling hut and her hill remained shrouded all day. 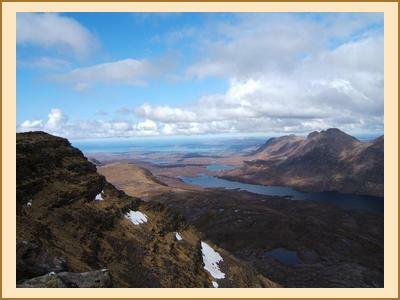 The others enjoyed a day of sunshine and excellent views - Fiona and Alison W were on Beinn Alligin, Gillian was on Baosbheinn and Beinn an Eoin and Richard & Anne climbed a Corbett and Graham alongside Loch Maree. Alison, Kenny and Alan climbed Liatach via the Northern pinnacles and found ice axes were essential for their day out - to help with grip on the steep grass! To round off an excellent day, we all headed off to a local restaurant for dinner. Unfortunately Sunday was a different story.... The cloud level remained stubbornly around 500m and was accompanied by a cold wind. It was a dry but fairly miserable day on all the hills. By 5pm however, the campsite was basking in sunshine so we piled on the warm jackets and sat outside until after 7pm - by which time we were almost blue with the cold. We had hoped for an invite to a "tent warming" in Kenny & Alison's new tent which has ample room to accommodate most of the club - unfortunately for us they weren't feeling that generous so instead we retired to a local hotel which had comfy seats and a ringside view of the sunset. Humphrey returned after dark following a day of mixed success - his 14 mile run in the morning went well but left him with insufficient time for Slioch and he had to turn back before the summit. Monday morning was beautiful again but with an even colder wind than the previous day. Most people headed off to do a small hill or a short cycle ride before the long drive home. Humphrey was staying up for another day and so was doing a 16 mile run to the Loch Maree Hotel and back before setting off for his hill - he was almost at the hotel when I passed on my way home!. Finally, a new feature for Meet reports - "hill of the weekend". 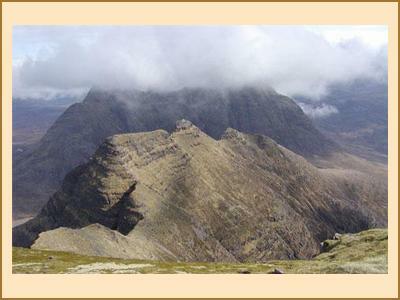 The winner was definitely Beinn a' Chearcaill alongside Loch Maree - over the course of the weekend it was climbed by seven of the ten folk present. The hill had a fantastic rock plateau on the summit and apparently has fantastic views of the Torridon hills - however only Richard, who climbed it on Monday, would have seen the view.